Ferrari has long promised that the Geneva Motor Show would introduce their most powerful supercar ever and this morning, the incredible LaFerrari debuted at the massive Suisse show – serving as the evolutionary successor to the mighty Enzo Ferrari. Leading up to the debut of the LaFerrari, there had been little handfuls of information about the chassis, the drivetrain and the limited nature of the new Italian supercar but today’s Geneva debut introduced us to the striking good looks and the unusual name of the newest Ferrari halo car. Over the past few months as Ferrari teased their next halo supercar, rumors indicated that it would be called the F70; following in the naming theme of the F40 and F50 that came before. Then when company documents began referring to the upcoming supercar as the Ferrari F150 Project, there was speculation that the Italian automaker would risk locking horns with Ford Motor Company once again with a name shared by Ford’s bestselling pickup. However, all of the speculation and rumors have proven themselves to be way off as the company has simply gone with the name of “The Ferrari”. While the various social networks are already abuzz with skeptics accusing Ferrari of not being very creative with the new LaFerrari naming, when you consider the fact that this is the most powerful road going car ever offered in the incredible history of the company, the straight forward name of The Ferrari does seem fitting. This isn’t a Ferrari…this is THE Ferrari. As we expected, the new LaFerrari is powered by a 6.3 liter V12 that produces 789 horsepower and 516lb-ft of torque with a maximum engine speed of 9,250rpm. Add to that powerful piece of Italian engine engineering the HY-KERS electronic assist system with an additional 161 horsepower and an unspecified amount of added torque and you have yourself the most powerful Ferrari ever sold for public use. The LaFerrari at full force makes 950 horsepower and “greater than” 664lb-ft of torque with all of that power being channeled to the rear wheels through a lightning quick 7-speed dual clutch automated transmission. This drivetrain allows the Enzo successor to rip from 0-62 miles per hour in less than 3 seconds (exact times have not been offered yet), 0-124 in less than 7 seconds while reaching 186 miles per hour takes right around 15 seconds. Ferrari hasn’t announced an exact top speed but the company has promised that the LaFerrari will top 350kmh – or 217 miles per hour. During test sessions at the company’s Fiorano test track, the new LaFerrari had a best lap time 5 seconds better than the legendary Enzo and 3 seconds better than the current F12 Berlinetta. Also, thanks to the HY-KERS race tested hybrid assist system, the LaFerrari is more efficient and less polluting than the Lamborghini Aventador so in addition to being the most powerful and the highest performance Ferrari of all time – the LaFerrari is also one of the most efficient supercars ever. The LaFerrari is the fifth installation in the Limited Edition Special Series of range topping supercars that began with the Ferrari GTO, followed by the F40, the F50 and the mighty Enzo. In addition to being insanely powerful and incredibly fast, the LaFerrari also follows the form of those previous halo cars with beautiful lines that are about function as much as they are form. Every line and opening on the body of LaFerrari has been carefully sculpted to improve fuel economy, performance cooling or all three. The radiator is mounted out front for supreme cooling and after the cooling air travels through the angular grille and through the radiator, it quickly exits through the vents at the front edge of the hood which helps to increase downforce and reduce lift at higher speeds. Additional radiators are located inside of the deep scallops behind the doors and as air roars over the front wheel arches and around the wheel openings, the air is funneled into these mid mounted radiators before being channeled back out through the rear of the car. Along with the debut of the full LaFerrari information and imagery, the Italian supercar builder put together an awesome video that walks you quickly through the history of the Ferrari Limited Edition Special Series before giving us a good look at the LaFerrari via a great many panning still shots. 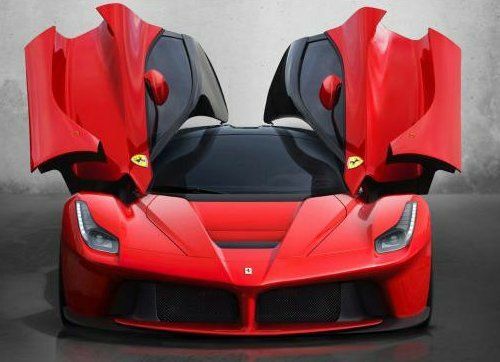 Inside and out, LaFerrari looks absolutely incredible and starting roughly a minute into the launch video – the new Ferrari Enzo successor is shown roaring around a closer circuit race course. We have attached the video below and I suggest that this video is viewed with the speakers cranked up nice and loud. The LaFerrari sounds every bit as awesome as it looks and this video gives us a look at just about every aspect of the new supercar in very short order. There has been no pricing announced for the new LaFerrari but we know that only 499 units will be produced – all of which are already sold according to company boss Sergio Marchionne. Rumors indicate that LaFerrari will cost buyers 1 million Euros/$1.3 million US dollars but that is the kind of price that you should expect to pay to have the most powerful street legal Ferrari ever built. Click any thumbnail on this page for a look at our entire LaFerrari gallery!